IHS Markit announced that it is lowering its smartphone AMOLED market forecasts, following lower-than-expected iPhone X sales (mainly because of its high price). IHS says that OLED makers will need to lower production costs of both rigid and flexible AMOLED panels in order to compete with lower priced high-end LCDs. IHS expected flexible OLED shipments to reach 167 million panels in 2018 - up 34% compared to 2017, but a much lower amount then the company's previous estimates. Total (rigid + flexible) OLED shipments in 2018 will grow 14% to 453 million. According to IHS, Apple may indeed adopt OLEDs in a lower percentage of its 2018 iPhone models than it previously intended too - and the same is true for major Chinese smartphone makers. Samsung, of course, is expected to continue and use OLEDs in all of its high-end smartphones. 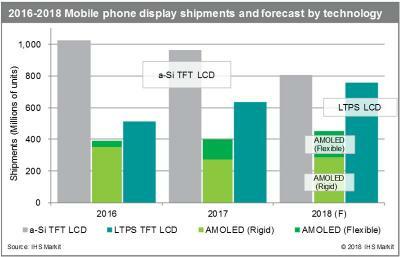 Looking further into the future, IHS sees OLEDs outpacing LCDs after 2020. Last month DSCC also revised its OLED market forecasts down.